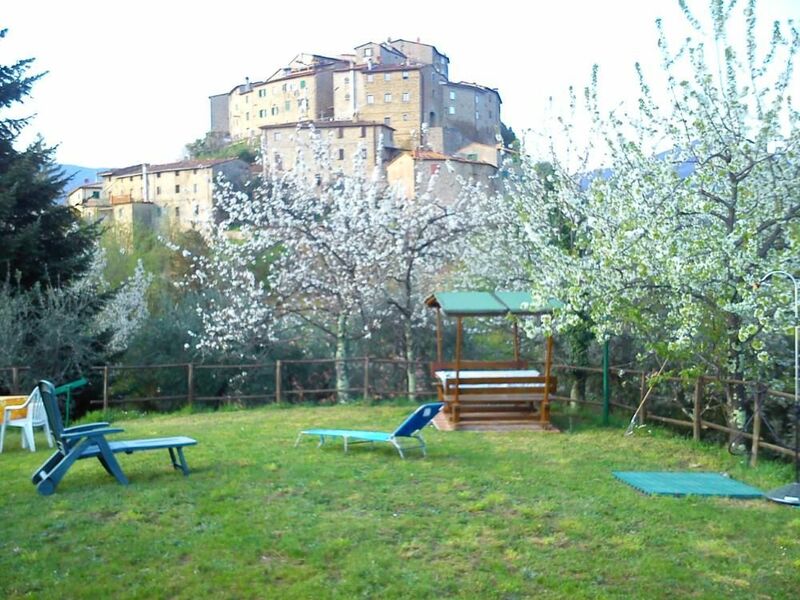 The house is at only 250 meters from the village of Aramo, a Middle Age castle with around a lot of olive trees. The area is called Svizzera Pesciatina, in this area you can visit in total ten small village called 'Castella'. It's place rich of woods, olive trees and some fruits trees as well. I am a person that like travelling and meeting people! This is the village of my grandfather. I produce olive oil from the olive trees around the house. It's a timeless place, here you can relax yourself. "The place is really nice and quiet, with lots of space around the house and view at the medieval Aramo. The very sweet and cute suprise were two kittens living in the backyard. We were very happy to spend there one week." "Das gemütliche kleine Landhaus hat einen wunderschönen Panoramablick. Sowie auch das Meer in nur sehr kurzer Zeit erreichen. Die Vermieter sind sehr freundlich hilfsbereit und entgegenkommend. Es war sehr schön dort. gerne würden wir auch wieder kommen. The cozy little house has a beautiful panoramic view. As well as the sea in a very short period of time. The landlords are very friendly helpful and accommodating. "It is a very good accomodation if you have a car. We made trips to Florence, Siena, Viareggio and other Tuscany places with public transport and it was possible but we had to wake up at 5 and return with the last bus at 17:20. Mr. Mariani was very helpful and rented some additional services for us and refused to take the agreed payment." "Vacanza fantastica grazie soprattutto alla fantastica casa dove abbiamo alloggiato, sembra quella delle favole, ideale per riposare e rilassarsi. Fornita di tutto e le foto rispecchiano esattamente la realtà. Un pò fuori da tutto, in questo borgo ma il bello è proprio questo. Proprietari disponibilissimi per qualsiasi cosa, persone squisite. "Ein sehr schönes ruhig gelegenes Haus. Typisch italienische Ausstattung. Viele Decken und sogar Handtücher vorhanden. Kamin und Holz stehen großzügig zur Verfügung. Sehr freundliche Vermieter (vor Ort allerdings nur italienische Sprache), trotzdem Verständigung ohne Schwierigkeiten. Sehr kinderfreundlich. Vom Olivengarten super Aussicht über die ganz Gegend. In der Umgebung gibt es viele Maroni-Bäume. Im Herbst kann man Esskastanien in Hülle und Fülle sammeln. Schöne Wanderwege und interessante Orte in der Nähe, Meer ca. 60 km entfernt." take the motorway A 11,then take the exit Chiesina Uzzanese and follow the sign Pescia. In Pescia you will meet the owner that will bring you to the house. Local cuisine, very good in a various tipical restaurants and tavernas. THE FINAL CLEANING IS 30 EURO FOR THE WHOLE STAY. THE GAS FOR HEATING COSTS A SUPPLEMENT PER CUBE METER, FROM OCTOBER TILL END OF APRIL. The wood for the fireplace is offered. Wi-fi for free... but not in the house, just outside. Tariffe scontate in relazione alla durata, Richiesto supplemento per il riscaldamento in base alla stagione (ottobre-aprile), Anticipo richiesto alla prenotazione, il saldo del pagamento al check-in, Consegna delle chiavi da parte del Proprietario non presente in loco, la pulizia dell'angolo cottura è responsabilità dell'ospite.